Why Many Men Prefer Electric Shavers? Quick Electric Shavers guide. When it comes to shaving, electric shavers have provided a clean and quick shave too many men all over the world. Shaving falls into the daily routine of many men. Not only is it safe, but it is also quite affordable in the long run. Read on to learn more about why men prefer electric shavers. As their name implies, electric shavers are electrical devices that are designed to be used for shaving purposes. The electric shaver is usually powered by a small motor which in turn can be powered by a battery or the mains. The trend of modern battery-powered electric shavers has been on the rise along with new, rapidly developing technology. There are two types of electric shaver currently available in the market: rotary and foil. Rotary shavers are equipped with circular blades that are designed to spin. Their flexibility allows them to contract into their housing in order to cater for any contours on the face of the person using it. Each of the blades on the shaver revolves completely independently of the others; this makes them perform much better at the contours of the neck and face. Rotary electric shavers are quieter, more suited to handling longer hair as well as offering the possibility of shaving in any direction – whether that’s up and down or side to side! The best selling rotary shavers brand is Phillips. The foil-type electric shavers are equipped with oscillating blades that are themselves hidden behind pierced steel foils. The foils tend to lift the hair up to the blades to allow for a smooth shave. These shavers have around 3 to 4 blades – technically, the more the blades, the quicker the shave. A lot of people prefer foil shavers over the former type – however, you’ll have to figure out which one would be ideal for you. The #1 foil shavers brand in the world is Braun. Convenient – One of the major advantages of using an electric razor is the fact that it provides maximum convenience. Whenever a time is a limiting factor, an electric shaver would help you shave in a snap. Not only that but because you van use them on dry skin without the need for any shaving cream or foam – they can be used on the go! 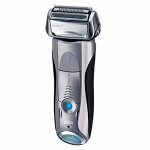 Quick – Electric shavers are best for providing a fast shave when the time is short. Cleaner – Other types of razors require the use of plenty of water and shaving cream – which creates a lot of mess. Electric shavers require neither water nor shaving creams which makes them a cleaner alternative to traditional shaving methods. Savings – Apart from the initial cost of buying an electric shaver, there are no additional expenses that are required. Electric shavers give great savings in the long run. Shave not as close – An electric shaver cannot give you as smooth a shave as with other types of shaving methods. Noise – The motor of the shaver can create a lot of noise and may be uncomfortable for some. Are you among the men who like shaving with electric razors? Tell me your thoughts in comments below. i always assumed more men would use an electric shaver versus a blade. the email i read says only 50% seem to use an electric devise, but they then stated that they believed that figure to be closer to 25%.